Blackedge cusk larvae (Ophidion muraenolepis) were raised from wild-spawned eggs at 77-78F on cultured copepods, rotifers and artemia. The larval duration was 34 days. First record of Blackedge cusk culture. The cusk eel family, Ophidiidae, is a group of eel-like marine bony fishes comprising about 30 species. Some cusk eels are found in shallow water, but most are deep-water fish. One cusk eel species, Abyssobrotula galatheae, was recorded on the bottom of the Puerto Rico trench at 8,370 m (27,460 ft), making it the world’s deepest recorded fish! 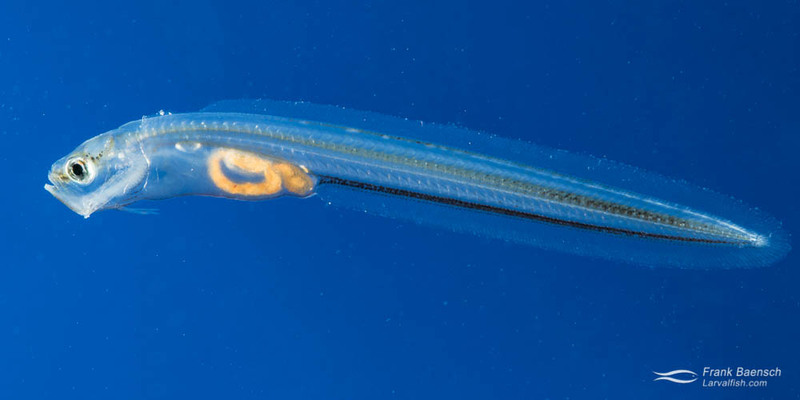 70-day-old Blackedge cusk eel juvenile. The pelvic fins of cusk eels develop into forked, barbel-like organs below the mouth. They are not related to true eels, which lack pelvic fins all together. Cusk eels produce pelagic eggs (either singly or in a gelatinous mass), unlike their close relatives, the brotulas (family Bythitidae) that bear live young. The largest cusk eel species, Lamprogrammus shcherbachevi, grows up to 2 m (6.6 ft) in length, but most species are shorter than 1 m (3.3 ft). A few larger cusk eels are prized food fish. Efforts are underway to farm the red cusk eel (Genypterus chilensis) in Chile. Three juvenile blackedge cusk eels (Ophidion muraenolepis) were cultured from a few eggs collected in Oahu’s coastal waters in March 2018. O. muraenolepis is a small (up to 15.5 cm/6”) substrate burying species that occurs at depths of 80 – 370 m (240-1170 feet) in the Pacific Ocean. The neuston tow also collected eggs from many other species; including tilefish, morays, chubs, cornetfish, butterflyfish, anthias, dragonets and parrotfish. This mix of larvae was raised together on copepods (Parvocalanus sp.) and rotifers. On day 16, three cusk eel larvae were transferred to a separate tank and offered Artemia sp. in addition to copepods and rotifers. On day 25, the lights were dimmed and sand was introduced to stimulate settlement. Juvenile cusk eels were raised for 72 days on Artemia sp.. They feed at night and hide in the sand during daylight hours. O. muraenolepis eel larvae were first identified in the mixed-species larval run 14 dph (days post hatch). Since early O. muraenolepis development was not documented; egg and larval descriptions of a close relative, O. scrippsae, will be used a reference. O. scrippsae are pelagic, slightly oval, measure about 1 mm in diameter, and float individually in the neuston. At hatching, O. scrippsae larvae have unpigmented eyes, a nonfunctional mouth, a straight tubular gut and measure approximately 2.5 mm SL. The gut coils between 7.5-8.5 mm BL (body length). Notochord flexion occurs between 9.6-11.5 mm BL, at which time the pelvic fin buds become visible (Ambrose et al., 1983). Blackedge cusk eel larvae cultured in the laboratory. Fourteen day old O. muraenolepis larvae have an angular jaw, a coiled gut and a very elongate body with a tapered tail. At this time, the 10.3 mm TL larvae have a full complement of rays in the caudal fin and appear to have completed flexion. 23 dph at 16 mm TL, the distinctive barbels (that develop from the pelvic fin buds) are visible. Near 32 dph at 22 mm TL, the larvae orient toward the bottom. They burry in the sand shortly thereafter. The three juvenile O. muraenolepis more than doubled in length over the next 30 days. Blackedge cusk eel larvae have a relatively short larval phase (just over 30 days) and are easy to culture from egg to juvenile. The larvae have no special rearing requirements in the early stages. However, late stage larvae become nervous under direct lighting. Using sand and darkening the tank were key to inducing the larvae to settle. Ambrose et al. (1983) described the development of Ophidion scrippsae through settlement using specimens raised from eggs collected in La Jolla Cove, California. The fish were reared in a black 100-liter tank and fed rotifers, harpacticoid copepods, and Artemia sp..
David A Ambrose, John L Butler, Geoffrey Moser, Barbara Y Sumida, Elaine M Sandknop and Elizabeth G Stevens. 1983. Description Of The Larvae Of The Cusk Eels Ophldion Scrlppsae And Chilara Taylor (Family Ophidiidae). CalCOFl Rep., Vol. XXIV.